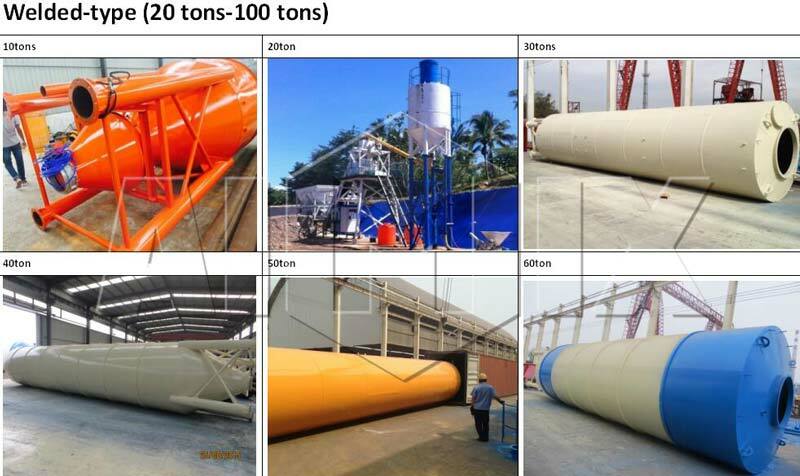 As a China cement silo manufacturer, Aimix Group has some types of cement silos for sale recently. 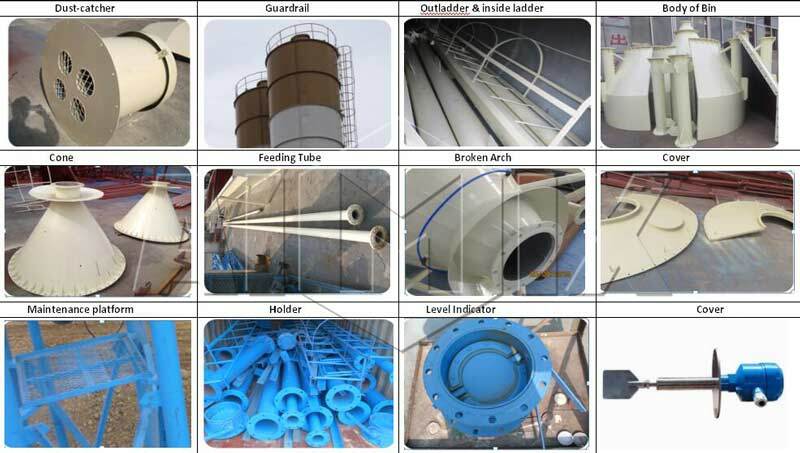 The detailed information are as follows: Cement silos are generally used in the storage of bulk cement in concrete mixing plants and dry mortar production line. Cement storage silos are closed tanks for storing bulk materials. They are suitable for storing all kinds of dried small particles materials or powder materials such as grain, cement, fly ash, and other bulk materials.therefore, they are aslo called fly ash storage steel silo or powder material storing steel silo by some customers. 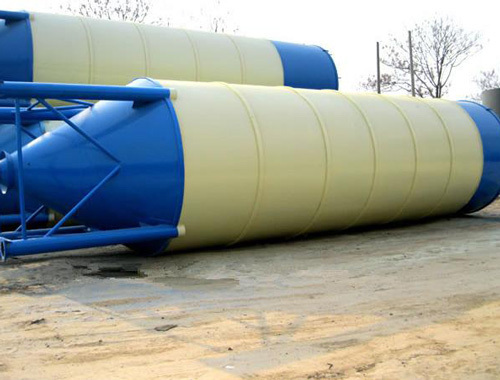 Through a screw conveyor, bulk materials inside the cement silo tank can be transported to various locations. According to the transportation method, we can divide them into welded type and bolted type. 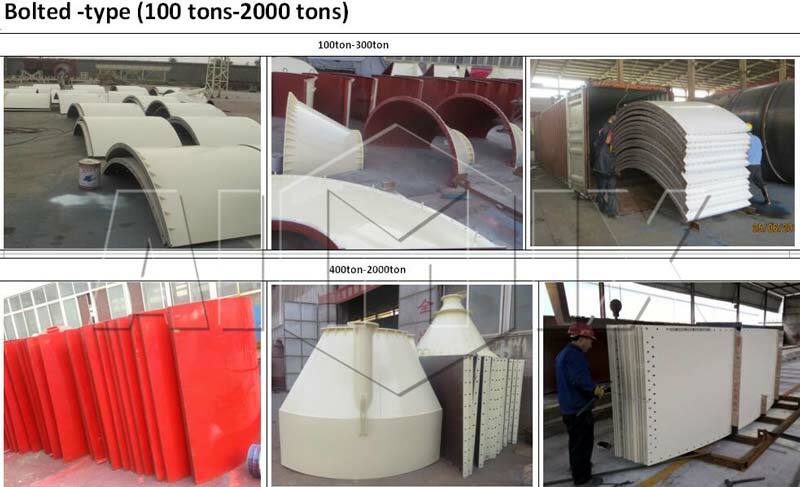 Welded-type cement silo (20t to 100t) are welded well in the production area and exported as finished products. Small cement silo whose capacity various from 20t to 100t is usually welded type. However, it should be noted that, If export by container, the silo capacity above 50 ton should be made as bolted-type which is easy to transport. Bolted-type large cement silos (100 tons-2000 tons) for sale are bolted together after they are shipped to the destination. Because they have large capacities, they are made into bolted type for easy transportation. The silo can be dismantled into many parts when transport, and can be installed with bolts easily, so it is easy to transport in container. The level indicator is used to measure the height of the powder in the cement silo. The basic principle is to control the signal lamp to achieve the warning function according to whether the material level indicator is in the contact range of the blade (whether the blade rotation is obstructed) or not. One or two can be installed in a cement silo. The one on the top of silo is used to measure whether the silo body is full. The one in the bottom is used to measure whether there is material in the silo to avoid empty positions phenomenon. The guardrail is generally welded by round tubes. It is mainly used for protection. When the cement silo needs to be maintained, workers need to climb from the outer ladder to the top and enter into the cement silo from the top access. The guardrail will protect the safety of workers. The function of broken arch is to make the material discharge smoothly. 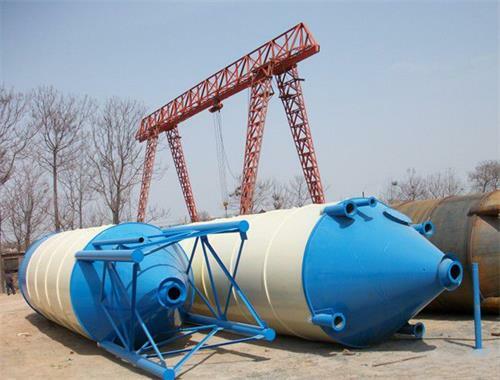 In general, when the cement silo discharges, since the silo body is large and the outlet is small, it is easy to form a blockage and the material cannot be discharged smoothly. When the silo discharges, compressed air will be inserted into the broken arch and gas cannons are placed inside the silo so that the material can be loosened and the material can be discharged smoothly. When the bulk cement pump truck transfers the cement into the silo, a difference in pressure between the inside and the outside of the cement silo will form, and the gas will be discharged from the silo. Since the powder material is stored in the cement storage silo, dust is easily generated and the air will be polluted. The function of the dust collector is to filter the gases discharged from the silo, and at the same time, achieve a balance between the internal and external pressures of the silo. Both welded type cement silo and bolted type cement silo are vertical cement silo. 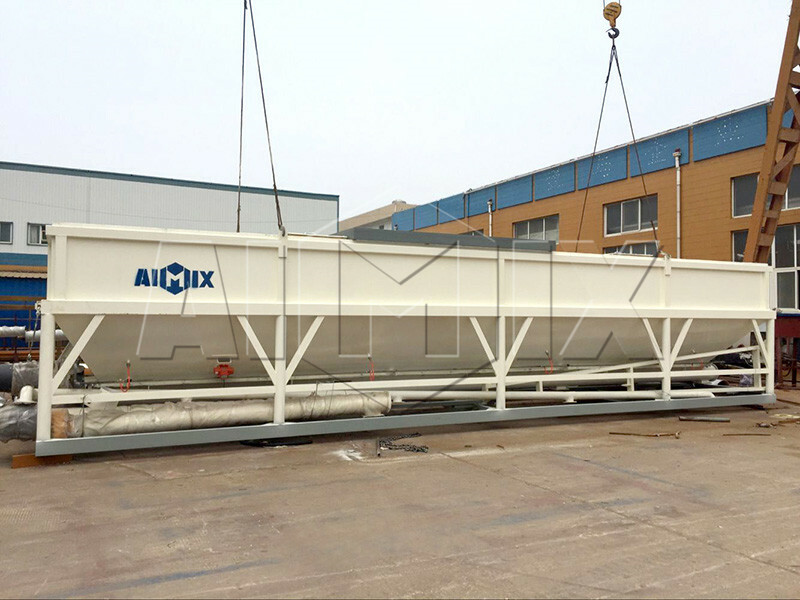 Aimix group also provides horizontal cement silo for customers to choose. Check whether the bag inside the dust collector needs to be replaced. If the dust collector adopts differential pressure control, look at the pressure difference table directly. 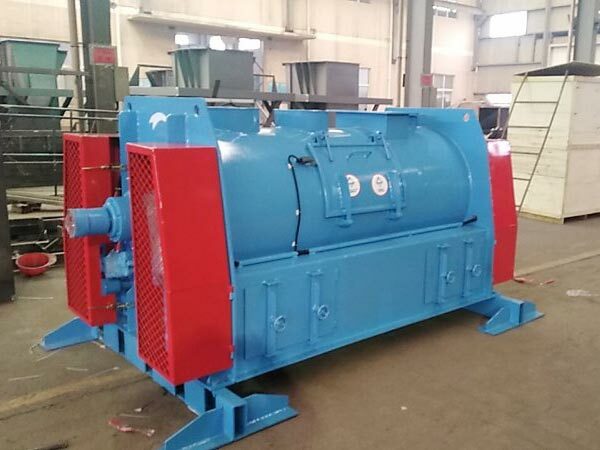 Check the dust removal system according to the different dust collectors, there are mainly mechanical dust removal mechanisms and pulse cleaning mechanisms. As to the power system, check whether the induced draft fan is running normally. Check the sealing performance to prevent air leakage. Want to buy cement silo? As an experienced China cement silo manufacturer and supplier, Aimix group has exported our cement starage steel silo products to Australia, uae, Qatar, South Africa, Gujarat, Iran, Pakistan, Indonesia, Cambodia, Sri Lanka, Qatar, India, Vietnam, Thailand, Romania, Peru, Korea, Sri Lanka etc. Countries. We have rich experience in manufacturing and exporting steel silo products. We usually have some types for sale on holidays, for example, 50t and 100t cement silo. Welcome to leave a message to inquire the price of them. We promise that we provide high quality silo products with reasonable cost. Don’t hesitate to leave your inquiry in the form below!